(CNN) - No balloons. No banners. No cheering crowd. No need for a victory speech to a throng of adoring and loyal supporters. As he sat in a prison cell in Texas, Keith Judd, inmate # 11593-051, was winning 40% of the vote in the West Virginia Democratic primary last week amid whatever fanfare one could receive in such a place. Judd, whose name appeared opposite incumbent Democratic President Barack Obama, was pleasantly surprised. "It's about time,' he said. "The message is out there." In a phone interview with CNN from prison, Judd explained his message is all about the economy and what he calls basic economic problems. "The poor and middle class are being controlled by the wealthy. It's like Monopoly," he said. "When one person gets all the money, the game is over." It could be argued that Judd's game for the presidency is already over. He's serving a 210-month prison sentence with an expected release date of June 2013. An earlier release date is a possibility, but even with that, Judd's next stop would be a half-way house in Midland, Texas, not the White House. Judd is not a novice to presidential aspirations. A 2008 attempt to get his name on the ballot in several states failed so he tried again this presidential cycle. He said his political movement represents the people who are tired of lying politicians, and people who want to see their country run by the people. His recent showing however is not without questions, which have emerged not because of his message, but because he's a 53-year-old incarcerated man who wants to run for president. Is he a Republican plant? Is he a Democratic pawn? Is he being bank-rolled? Judd is unconcerned. "If someone in the Republican Party is doing something, they haven't told me," he said. When asked where the $2,500 filing fee came from, Judd's answer was muddy at best. He claimed he didn't know, said it didn't come from him and that maybe somebody involved with the "movement" supplied it. The West Virginia secretary of state's office said three separate money orders accompanied Judd's filing application. The money orders came from Citibank and the return address on the envelope was Leopard Drive, Texarkana, Texas. That's the address of the federal prison. Still, Judd claimed he didn't know the money's origin. Judd's political offense is putting some West Virginia state officials on defense, especially the secretary of state. Late last week, days after the primary, Natalie Tennant held a news conference to answer the onslaught of questions her office had been fielding on how the name of a convicted felon got on the ballot. Tennant told reporters she understood the emotions and passions Judd's name has stirred and then simply went on to explain that not allowing Judd to appear would have been a violation of the law. 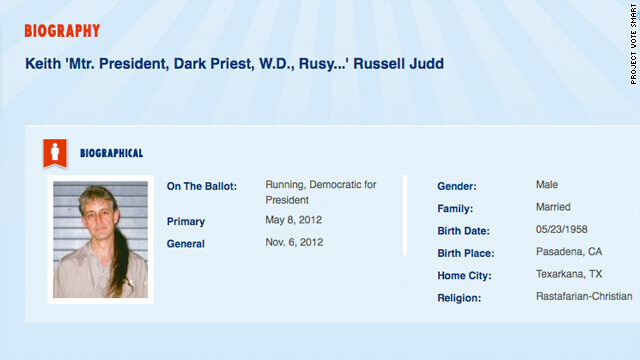 "It's not the first time a felon has been on the West Virginia ballot for president," she said. "From 1992 to 2004 Lyndon LaRouche was on each of the presidential year ballots despite being a convicted felon. In 1996 he even received about 40,000 votes against Bill Clinton." When CNN's Jim Acosta traveled to Bolivar, West Virginia, last week, he was not hard-pressed to find people to talk about the primary day. Many said their vote for Judd was not an endorsement of him, but rather an act of protest against the current administration and its policies. Judd doesn't see it that way: "I think some people really voted for me, not just against Obama"
Invoking another cultural icon, Judd drew a comparison between the economy and the television show Gilligan's Island. "Thurston Howell was a millionaire on that island, but his money didn't do him any good when he was stranded," Judd said. "Work has value because you can trade it for something of value." Judd, who is not allowed access to the internet while in prison, may never know the real force of his movement. He admits he has not gotten any feedback following his West Virginia showing. "The mail is kind of slow here," he said. His resides prision n texas but is running n west virgina. Isn't that what lugar just lost his seat 4? Mr Judd believes it is all about the economy. Just who does he believe is on the side of the middle class and the working poor. If he believes it is Mitt Romney and the Republicans he needs to do a little more research. Ok let him do what he wants you dont have to vote for him. Yeah he may be a convicted felon but he's still a person. And yeah Obama got 60% of the votes and the reason they have an article is because everyone was shocked that he actually got that many votes. Come on people how dumb can you be? Honestly, use your brains. A meth-head in prison? No problem to the good Christians in West Virginia. He's white. I can't believe that CNN even posted this article. Really? This is "the movement"? A convict! You clowns have elected people who don't believe civil unions are a civil liberty and now you want to replace them with a convict? What's next? Making Mexico a state? The economy for this guy is perfect. He has 3 hots and a cot and no worries about finding a job.